The accident-prone service road down the Hotel Novotel was in the news for the wrong reasons again as a sand-ladden lorry came crashing down the steep gradient and jumped the divider before hitting the parapet wall on the Beach Road, in the wee hours of Thursday. However, no casualty was reported as the road otherwise teeming with tourists and beach visitors was almost deserted in the early morning hours, averting a major tragedy. Preliminary investigations suggested that the mishap occurred at around 4 a.m. after the driver lost control on the wheels owing to the malfunctioning of brakes, the police said. This stretch remains a hotspot for mishaps as four such accidents have been reported in the last 10 years. On April 30 last year, a private school bus rammed into the parapet wall in a similar fashion and ploughed into a group of people relaxing on the beach on a Sunday evening. IPS officer D.N. Kishore’s father Dusi Dharma Rao, a retired professor, and his 12-year-old son died while Mr. Kishore himself and his daughter among seven people sustained severe injuries. Again on June 4, 2014, an autorickshaw rammed into the parapet wall, killing one person and injuring eight. 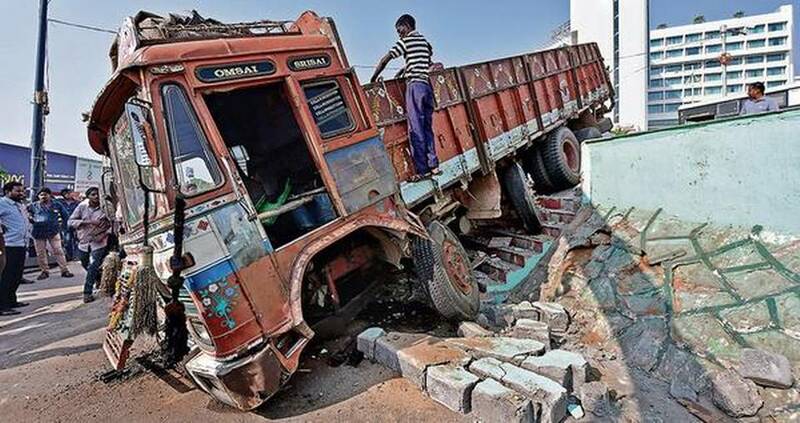 Three people died under the wheels of a water tanker and five including beach visitors and hawkers received injuries in a similar accident on August 6, 2006. Apart from this, a number of minor incidents were also reported from this stretch and the common thing in all the cases was the pattern—brake failure, coming down the steep gradient and crashing into the parapet wall. Yet, there seems to be no permanent solution to the problem. “The stretch down the Novotel Hotel is not the only hotspot for mishaps on the Beach Road, but also the ones down the KGH, Pandurangapuram and R.K. Mission as all are steep gradients,” former bureaucrat E.A.S. Sarma said, adding that it is time the RTA played a proactive role in churning out a permanent solution. The police are mulling major road engineering intervention. “We will soon approach the engineering departments of Andha University and GITAM Deemed to be University to survey the area and come up with some permanent solution,” ACP (Traffic) M.R.K. Raju said.